NV-216A-PV Video Transceiver with Power is a passive (non-amplified) device that allows the transmission of real-time monochrome or color video over Unshielded Twisted-Pair (UTP) telephone wire. Baseband (composite) signals of any type are supported. 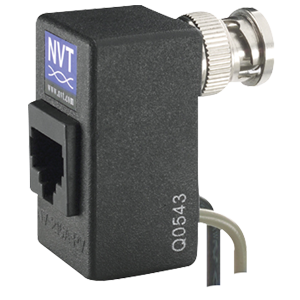 NV-216A-PV video transceiver allows transmission of CCTV video and low voltage power over UTP cable. The NV-216A-PV incorporates the transceiver engine of NVT’s popular NV-214A-M video transceiver with the added value of camera power connections. Power and Video are routed via UTP and RJ45 connections. Used at the camera, the passive NV-216A-PV has a compact body, a male BNC for direct connection to the camera, and is compatible with NVT’s PVD™ product line. Connect the RJ45 to 4-pair cable to be routed to the NVT Phybridge cable integrator and on to an active or passive receiver hub in the MDF/Control Room.